The tiny Caribbean nation, with a population of just 1.3 million, lies about 10,000km from the former Isis capital in Raqqa. Yet at the bloody peak of the group’s power, Trinidad and Tobago had one of the highest recruitment rates in the world. More than 100 of its citizens left to join Islamic State, including about 70 men who planned to fight and die. They were joined by dozens of children and women, the latter including both willing and unwilling companions, security officials say. Trinidad’s Muslims make up around one in 10 of the country’s population, and the overwhelming majority follow moderate forms of Islam. But a tiny minority have been drawn to a more extreme creed. In 1990 a group called Jamaat al Muslimeen launched the western hemisphere’s first and only Islamist coup attempt, taking the prime minister and legislators hostage for several days. Eventually the army regained control, but the imam behind the coup, Yasin Abu Bakr, was released from jail within a couple of years under an amnesty deal and has resumed preaching. Young men, many of them recent converts, were drawn to the caliphate mostly by promises of money and a sense of community – an appeal similar to that of gangs in an increasingly violent country, he said. “[A gang] provides a family, male role models, social order and it promises access to what many young men might think they want: money, power, women, respect,” said Kerrigan who has researched extremism for UN counter-terrorism units. In many ways, the two recessions are similar, with the oil curse leaving its mark on both. The non-hydrocarbon sector is incapable of carrying Trinidad and Tobago’s economy on its own. There are the same stories today as there were in the 1980s of declining incomes, lost jobs and the hopelessness that uncertainty brings. But the country did learn from the 1980s. The government now has a Heritage and Stabilization Fund that helps steady state expenditures by setting aside surpluses in the good years for distribution in the down ones. Although the fund’s resources are severely limited, its spending so far in the recession is one reason the current contraction has not been nearly as severe as it was in the 1980s. That said, Trinidad and Tobago faces an environment today that is much less conducive to a solid recovery. Since 2000, there has been a marked increase in crime and violence, corruption and ethnic tensions in a country home to East Indians, Africans and many mixed identities. Those tensions have fed violent extremism, including from marginalized Muslims that make up only 8 percent of Trinidad and Tobago’s population of 1.3 million people. Many fear that this economic and social deterioration cannot be easily reversed, or even halted, if oil markets recover. Read Robert Looney’s full article here. Simon Cottee asks, ISIS in the Caribbean. Trinidad has the highest rate of Islamic State recruitment in the Western hemisphere. How did this happen? In a recent paper in the journal Studies in Conflict and Terrorism, John McCoy and W. Andy Knight posit that between 89-125 Trinidadians—or Trinis, to use the standard T&T idiom—have joined ISIS. Roodal Moonilal, an opposition Member of Parliament in T&T, insists that the total number is considerably higher, claiming that, according to a leaked security document passed on to him, over 400 have left since 2013. Even the figure of 125 would easily place Trinidad, with a population of 1.3 million, including 104,000 Muslims, top of the list of Western countries with the highest rates of foreign-fighter radicalization; it’s by far the largest recruitment hub in the Western Hemisphere, about a four and a half hour flight from the U.S. capital. In 2011, the government declared a state of emergency, in response to a wave of violent crime linked to drug trafficking and intelligence reports warning of an assassination plot against the then-Prime Minister Kamla Persad-Bissessar and senior members of her cabinet. At-Trinidadi, along with several others, was detained on suspicion of colluding in the alleged plot. In Dabiq, at-Trinidadi, alludes to this, but denies any involvement. “That would have been an honor for us to attempt,” he acknowledged, “but the reality of our operations was much smaller.” He also credited a Muslim scholar named Ashmead Choate as a formative spiritual influence. Choate, a fellow Trini and former principal of the Darul Quran Wal Hadith Islamic School in Freeport, central Trinidad, reportedly left for Syria between 2012 and 2013, taking his family with him. According to at-Trinidadi’s testimony in Dabiq, Choate, who was detained alongside him during the state of emergency, was killed fighting in Ramadi, Iraq. Long-time readers of this blog may recall that in 2007 Kareem Ibrahim from Trinidad was arrested as member of the JFK terror plot to blow up the airport’s major fuel supply tanks and pipeline. Earlier yet, Trinidad had an Islamic insurrection – read the full article. Venezuelans went to the polls yesterday. The opposition won in a landslide . More on that later today. Elsewhere, Middle Eastern Men Arrested Near Mexican Border with Steel Cylinders. Macri v. Cristina In The Presidential Staff And Sash Hand-Off Clash. Mauricio Macri and Cristina Kirchner throw hissy fits over what are essentially beauty pageant paraphernalia. Bolivia to send attorneys to Paraguay and US over FIFA scandal. General attorney Ramiro Guerrero said on Friday that next week a group of attorneys would meet in Asuncion (Paraguay). In the Amazon, the ‘world’s most endangered tribe’ has few options. Brazil’s ‘isolated’ indigenous communities don’t typically leave the forest. But it’s happening more often. Macri Meets With Chilean President Michelle Bachelet. [Argentina’s] President-elect Mauricio Macri ends his “express tour” with a meeting with Chilean President Michelle Bachelet. Colombia finds galleon ‘holy grail’. Undated handout from Colombia culture ministry showing remains of San Jose galleon. The wreck of the San Jose, a treasure-laden Spanish galleon sunk by the British 300 years ago, has been found off the Colombian city of Cartagena, President Juan Manuel Santos announces. Panama Disease could wipe out most bananas. The one strain of bananas that accounts for 99 per cent of the market faces a disease that could decimate crops. U.S. citizen Lori Berenson, who spent 15 years in a Peruvian prison for aiding leftist rebels, was expelled from the Andean nation after completing a five-year parole. Amid a crush of reporters, some in the airport shouted “terruca” (terrorist) at the American woman as she carried her son to the gate. Berenson was arrested in December 1995 as she was leaving the Peruvian Congress. Prosecutors said she entered the premises with false press credentials to obtain information on the building’s security systems for use in planning an attack by the Tupac Amaru Revolutionary Movement, or MRTA, guerrilla group. The U.S. Federal Bureau of Investigation has charged 10 Puerto Rico officials and businessmen, including a leading fundraiser for the governing party, with corruption, extortion, bribery, and wire fraud. Puerto Rico’s U.S. Attorney, Rosa Emilia Rodriguez-Velez, said on Thursday in a statement that the 25 count indictment exposes the “underhanded dealings” and cronyism within the island’s cash-strapped government. In other news, The Supreme Court on Friday agreed to decide whether Puerto Rico, which is in the midst of a financial crisis, may allow public utilities there to restructure $20 billion in debt. Trinidad to Seize Assets of Terrorist Jailed in U.S.
Ibrahim, 70, was sentenced to life in prison in the United States after he was found guilty of conspiring with others to detonate fuel tanks and a pipeline at New York’s John F. Kennedy International Airport. The Die Is Cast on Venezuela’s Congressional Elections.How Will Chavismo Respond to Its Inevitable Defeat? At an event to mark the closing of his campaign ahead of Sunday’s elections, a self-assured Evo Morales told Bolivians that he will win all over the country and will even take the opposition’s bastions of support in the east. The wave of violence, which has left at least three people dead and 41 buses destroyed, has spread to 31 cities in Santa Catarina, whose authorities say the attacks are ordered by a criminal gang from Argentina. A West African man held in isolation at a Rio de Janeiro hospital on suspicion of bringing the deadly Ebola virus to South America has tested negative for the disease, the Health Ministry said Saturday. A Raúl Sendic, candidato vicepresidencial de Uruguay, junto a Tabaré Vásquez, por el movimiento izquierdista Frente Amplio, del presidente José Mujica, le salpicó la “maldición“ del petróleo. Un cuestionado convenio de canje de crudo por derivados entre Ancap/Trafigura/Petroecuador que involucra USD 6.400 millones, empezó a pasar las primeras facturas, en medio de la campaña electoral. El escándalo ampliamente cubierto por la prensa uruguaya, hace referencia al libro Ecuador Made in China, y a una carta remitida al gobierno uruguayo y a varios legisladores de ese país. La referida cláusula del Convenio señala que Ecuador proveerá hasta 36000 barriles diarios de crudo, sin embargo en el contrato firmado el mismo día en Montevideo, se estableció la entrega de hasta 100000 barriles diarios, con lo que se violó el Convenio. Incluir un volumen de 100000 barriles día notificaba al más ingenuo que el crudo no estaba destinado a la refinería uruguaya, cuya capacidad máxima, cuando está operativa, es de 50000 barriles día, y de un crudo diferente al ecuatoriano. Al respecto, la Contraloría abona con conclusiones que dejan sin respuesta a los autores del Acuerdo: “se contrató con Ancap, sin que existan estudios técnicos que demuestren los beneficios para el país de una contratación directa”, señala en organismo. The Women’s Legal Defense and Education Fund urged the appeals court to rule for Chevron on a highly technical but critical issue. You read that correctly: The nation’s oldest women’s-rights legal advocacy organization, a left-leaning group that helped enact the landmark 1994 Violence Against Women Act and represents victims of sexual harassment and spousal brutality, supports the multinational oil company in its struggle against a crusading lawyer who claims to represent the impoverished and oppressed. Could capitalism save the Arabs? Mexico: Government paying its citizens to avoid deportation from U.S.
Why bother covering up the Cartagena, Colombia, prostitution scandal? US-Latin America stories of the week. Iranian Foreign Minister Mohammad Javad Zarif and his counterpart Bruno Rodriguez Parrilla expressed their deep reservations about the threats of military action against Syria in a telephone conversation on Wednesday. Iran and Cuba: Chummy enough to do joint conference calls on behalf of Assad, no less. 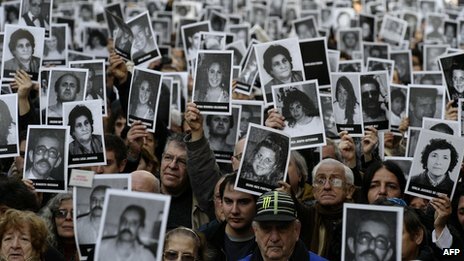 A former Argentine judge has been extradited to face charges of human rights abuses during the 1976-1983 military rule. What’s most amazing about the arrest in Miami of Bolivia’s top anti-corruption police official, caught on tape extorting a bribe from a well-known businessman, was that hardly anybody was surprised by the news. Mexican President Enrique Peña Nieto is expected to introduce Sunday a wide-reaching proposal that seeks to boost federal tax revenue, a move that could prove politically complicated in a slowing economy. Mexico: Will the teachers imperil reforms? An Argentine prosecutor has accused Iran of trying to infiltrate countries in Latin America to sponsor and carry out “terrorist activities”. In his report, Mr. Nisman contended that the 1994 bombing was not an isolated event. “It has to be investigated as a segment in a larger sequence,” he said in a report summary, pointing to parallels with the case of two Guyanese men convicted in 2010 of conspiring to attack Kennedy International Airport in New York. In that case, a former Guyanese government official, Abdul Kadir, opened himself to a claim by prosecutors in New York that he secretly worked for years as a spy for Iran when he said during cross-examination that he had drafted regular reports to Iran’s ambassador in Venezuela on plans to infiltrate Guyana’s military and police. The plot to attack the airport did not advance beyond the conceptual stage. 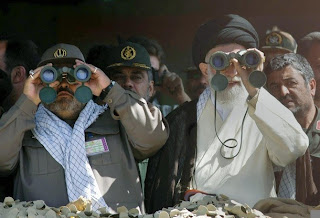 Mr. Nisman, who has investigated the bombing since 2005, suggested that “criminal plans” by Iran could be under development in Latin America, including Brazil, Chile, Colombia, Guyana, Paraguay, Suriname, Trinidad and Tobago and Uruguay. And let’s not forget the direct flights fron Tehran to Caracas. Remember that botched attempt to blow up John F. Kennedy airport in 2007? An Argentine prosecutor accused Iran on Wednesday of establishing terrorist networks in Latin America dating back to the 1980s and said he would send his findings to courts in the affected countries. A pact with the devil?